Today was my happy time of the month. That’s right, my licorice of the month club selections from Licorice International have arrived! Woo hoo! This month the selections were Black Opal Real Australian Licorice and a nice bag of Good & Plenty. As my avid licorice review readers already know, my very first review was of Good & Plenty, one of my favorites. As such, I won’t review them again, other than to say that Licorice International sent a very soft, fresh sample and should be commended for making sure their bulk Good & Plenty isn’t stale. So, on to the new candy. This was a 6 oz. 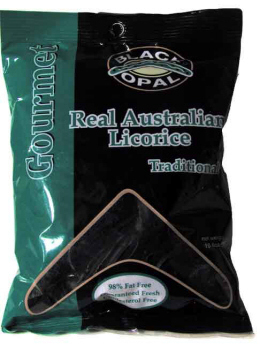 bag of Black Opal Real Australian Licorice Soft Eating Traditional. Quite a mouthful, but in all honesty, this stuff is worth it! The candies themselves are a little over an inch long, a nice black, tubular in shape, and man oh man are they soft! Their texture is just beautiful; unlike some other licorice choices, these are not at all sticky. Their flavor is also delicious. With a light sweetness and a combination of licorice extract and aniseed oil for the licorice flavor, they should appeal to both European and American licorice lovers. They are really excellent examples of licorice candy, and I highly recommend them for any licorice lover in your life! You can buy Black Opal Licorice at Licorice International, but the traditional flavor is currently sold out. Instead, try raspberry! I am planning to open an ice cream/candy shop soon. I am looking for high end, imported candies. I am interested in the Black Opal Australian Licorice, Lindt Chocolates and anything in that quality. Please let me know if you can provide these and that quality. Please send literature, price lists, samples, etc. Thank you. I realize this comes some time after the fact, but on the off chance you do see this, and aren’t already aware of it, Black Opal Licorice is available at Target stores (At least they are here in the Milwaukee (WI) area. The stores I’ve been in carry both the traditional (black) and raspberry flavors). Oh my! I just purchased a 10.6 oz bag of Black Opal traditional flavored licorice at Target the other day and It is just the best licorice I’ve ever had! I love the soft consistency and the intense flavor. I’ve got to get more because, I’ve eaten the whole bag in about two days! Exceptional taste, good mouthful size pieces, excellent consistency and very uniform. Taste is every licorice lovers dream. Good chew with lasting aftertaste…. Well worth a try… You’ll be back for more… I guarantee!! I’m so sad to say I have been buying Black Opal at Target for some time now and when I went yesterday I was shocked that it was not on display.. I assume no longer available. Instead, they had a brown bag of Darrell Lea Soft Eating Original Liquorice… I bought it to get my fix, and am so very disappointed… just does not compare in any way to Black Opal. Sadly, I wont be buying any more licorice at Target if it’s not Black Opal. I, too, have been buying Black Opal licorice at Target for quite awhile. Alas, they have discontinued it. I have not yet tried the new “replacement” black licorice. I have tried other brands in the past and have been terribly disappointed. Has anyone tried “Panda” brand? It used to come in a little box and it was almost as good as Black Opal. I can’t seem to find either one anywhere. I am now discovering Starburst Gummies. They are fantastic!